Contemporary art costing £65,000 has been unveiled in a south Wales valley town centre. 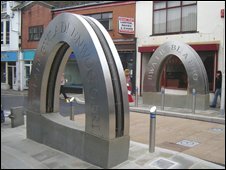 Two arched sculptures, designed by artist Howard Bowcott, have been erected in Pontypridd as part of regeneration work. Mr Bowcott said his work was inspired by the huge chain links made at the former Brown Lenox works in Pontypridd. The sculptures also feature "inspiring words" from poet and playwright Menna Elfyn cut into the polished steel. Mr Bowcott, who lives in Gwynedd, said he wanted the sculptures to hark back to Pontypridd's industrial past while also producing something contemporary. "The idea of spending some money on the artwork is to set people's imaginations going and get people thinking that we can do quality here, get people believing in the town," he said. "Pontypridd was a hub for iron ore from Merthyr and coal from the Rhondda. It was a vibrant hub of activity. "We saw the (chain) links as a metaphor for that. "You only see one half of a chain link so it's also a nice little reference to the stone arch of the bridge in the town and the arches of the railway viaduct." The art is part of a wider programme of work funded by Rhondda Cynon Taf council and the Welsh Assembly Government to improve the town centre. Paul Cannon of RCT council said: "This is an incredibly exciting project and clearly illustrates that the gradual regeneration of Pontypridd is becoming visible to all who visit, live in and work in the town centre." The sculptures, which light up at night, certainly managed to turn heads among shoppers. While some were perplexed by the two steel structures springing up in Taff Street, others welcomed efforts to give the town a modern twist. Jay Shiells, 27, said: "It's nice to see money being spent on something visual. "Pontypridd has always been a little bit, how can I put it, not the best-looking of places. "It's starting to turn into something nice." Ian Anderson, 47, originally from Nottingham, was unaware of the references to Pontypridd's history but was still impressed by the sculptures. "As modern art, it's quite nice," he said. "I wondered what it was supposed to be, perhaps a kind of gateway or portal into the town centre." I hadn't noticed them. I'm shopping until I'm dropping, I'm on a mission! The words on the sculptures, in English and Welsh, came from Menna Elfyn after holding poetry workshops with local children. There are four phrases: Bwa I Bobl a Bro (An arc for people and vale); Links to Unite Valleys; Song's Heart Beating Feet on Earth; and Gwlad! Gwlad! Enwog o Fri (Country! Country! Famous and renowned). Some people liked the words but not everyone was convinced, including one of the Pontypridd High School pupils who actually took part in the workshops. Georgia Evans, 14, who was at the sculpture with other pupils for a photo-shoot to mark the unveiling, said: "It doesn't describe the area it was meant to describe. "It doesn't make you think of Pontypridd." But fellow pupil Nathan Payne, 14, disagreed and said the sculpture was "cool". "It made me think of all the coal mines and steelworks because of the colour and how it's made," he said. Enthusiastic shopper Emma Garland, 30, from Nelson, managed to walk past the sculptures without noticing them, clearly having other things on her mind. "I hadn't noticed them. I'm shopping until I'm dropping, I'm on a mission!" she said. "They're all right aren't they? "The town could do with a bit of tidying up, it's a bit behind the times compared to Cardiff." While the £65,000 price tag shocked some people, Kirsty Andrews from Beddau estimated the cost as "a million perhaps" so was pleasantly surprised. "I thought it was going to be a lot more than that," she said. 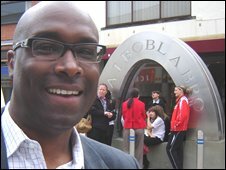 "I think Pontypridd is improving to be honest, about time as well!" Carol Jones, 68, said: "Rubbish! When they light up there's nothing there and you can hardly see them. "I expect I'll get used to them one day."